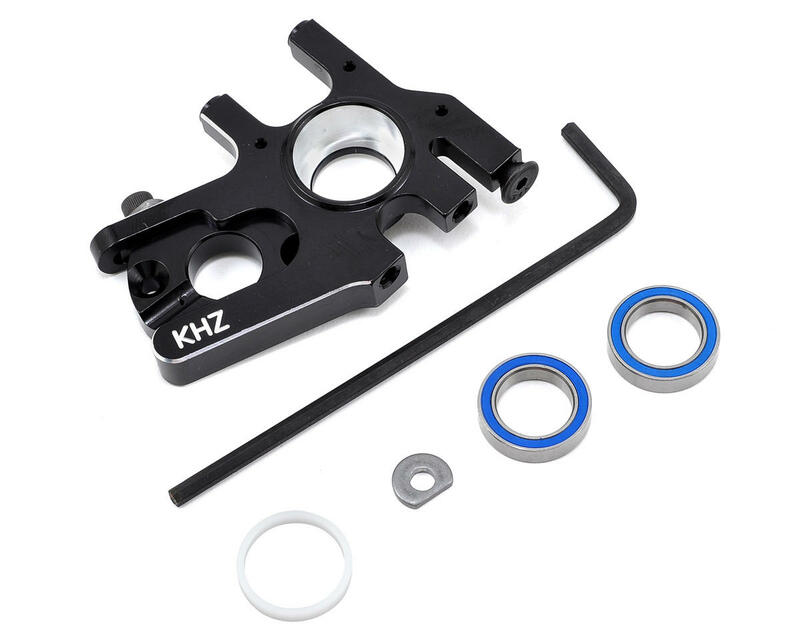 This is an optional King Headz Motor Mount, and is intended for use with the Losi TEN-SCTE. This motor mount uses two 12x18mm bearings to virtually eliminate the out drive wobble in the center differential, allowing the rear drive shaft to run true and smooth. The mount also uses a larger motor cam adjustment screw and the slot for adjusting the gear mesh has been increased in length to accommodate pinions from 12-24 teeth. Additionally, there is a third mounting hole in the bottom that is used when mounting the mount on the King Headz Chassis. This Motor Mount is CNC machined from 7075 aircraft grade aluminum and anodized black. The King Headz motor mount was the best upgrade I made to my TLR SCTE 2.0. The double bearing system reduces the wobble and reduces the wear on the center outdrives/diff case. It is definitely a good investment from both a performance and maintenance perspective. I bought this so I could run a 24t pinion on my SCTE. Very well designed/constructed. Locks the motor very securely with a much larger allen screw made from a harder material. Also, the dual bearing system is a HUGE improvement in stabilizing the center differential over the stock mount. Never using a stock mount again! NICE PRODUCT. Can do away with plastic spacer under diff on SCTE 1.0. Stock chassis or TLR Flex. Lowers diff bout 2mm. ZERO vibration. Do yourself a favor and get the whole setup, F and R diff towers and brace with transponder mount. Very happy with mine. Great product, smoother than stock but the 6x32 screw is way too soft. Stripped only after a few adjustments. Fits fine on the SCTE 2.0 chassis, a straight swap with zero mods, no idea what the hell the other reviewer on here was going on about, more than likely he had the mud guards on the wrong sides!! 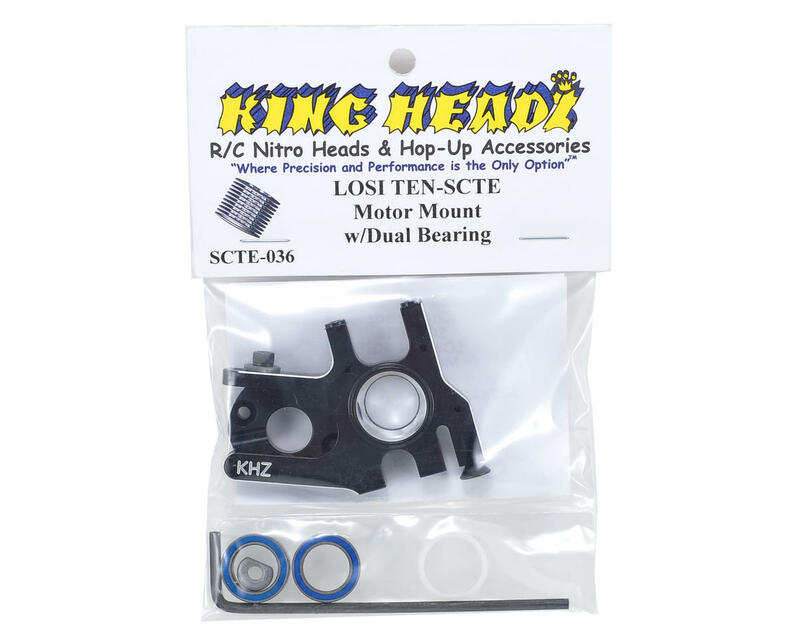 The King Headz Motor and Center Diff Mounts should be one of your first upgrades on the Ten-SCTE! The dual bearings takes almost all of the runout and freeplay in the center driveshafts. My only issue is some interference with the set screw for my Losi Mod 1 17-tooth pinion gear. I had to use the Dremel tool with a cutter to shave some material off of the motor adapter plate and also from the motor mount's bottom "arm" where the adapter plate slides into. The pinion gear's set screw sticks out just enough so that it was contacting those surfaces and grinding them down. If you can find another Mod 1 pinion gear with a shorter set screw you won't have any interference issues. Must have upgrade. Reduces power robbing, and damaging drive train vibration. Great product and very well made. Reduces all the original slop and wiggle. I use the Novak Mod 1 pinions as well, and never had any issue with mounting them at all. Not sure what the problem was regarding the other review since I use the same thing without any issues. The novac mod 1 opinions and the opinions interfered with the motor mount. Lucky enough to own a milling machine to fix the issue. We had to bore the motor plate 5mm larger than factory and then counter bore the mount almost to the engagement slides to get the set screw to clear. After 3 attempts to contact the maker all we were told was " we know"
10x stronger then the stock one and the screw it "BEEFY" and is builts with very high tolerances. A definite must have for any serious racer or basher!! I purchased this and the kingz head center diff mount it elimates all that slop in the center diff works awesome !!!!!!!!!!!!!!!! Worst mount I could have asked for. I have disassembled my scte completely for the second time and this is the second time I had problems getting the screws out of the mount. The first time I was able to use a torx bit once the Allen was stripped. This time no such luck I had to drill it and rendered the motor mount useless at this point because the rest of the screw is stuck in it. This being a critical component of maintenance for the drive train removal I will go back to the plastic one. Dislaimer: I am using this on an SCTE 2.0. First off, I had to grind some aluminum away from the lower right side of the motor mount, where it hits the plastic chassis plate guards. It does remove the slop from the center differential, but that could be mostly due to replacing the worn out bearings. We will see how long these hold up, but either way it should last much longer than the stock setup. My biggest beef is that the motor mount doesn't allow much adjustment for gear mesh. I'm using a Neucastle 3800 motor and am restricted to using 12t or larger pinions, even with some filing and grinding. This is why it only gets 3 stars from me. Amainhobbies says it fits the 2.0 kits, but not without some slight modification.